"I've been looking down so long, I don't know which way looks up." An * indicates my favorite sites. Most of Denmark is very picturesque, despite my attempts to capture its downward elements. This is not a cover, but it is on the ground and is round. I suppose Danish and other sailors could fall into a hole if they do not observe the wisdom of the directional compass and the stars. Here is a small cover with a stained glass window approach to the design. It's almost as if the artist was out of his lifelong trained field. It's one of the first shots I took on the rainy day that I arrived in Fredericksburg Denmark. This cover shows an example of contemporary design typical of the Danish covers. 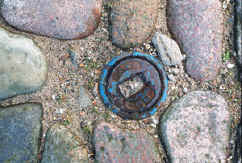 This valve was tucked away in a remote area of Copenhagen near the water. This cover might have some Viking history, but I didn't think to ask my friends about it. Maybe I will during the next visit. This post hole is used to support chains in the event of a regal visit (burial or otherwise) to the church in Roskilde. These covers have a very slick design, but they can fit into the hole when removed and turned sideways. 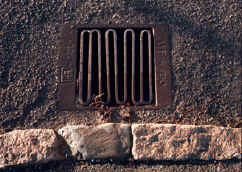 This whimsical drain is situated in Roskilde. This puddle is also situated just outside the house of my friend Sinne's parents. It was not very cold in Denmark, despite the rumors to the contrary. This cover shows the presence of Atlanta's need to maintain their contemporary internet plumbing. While I was shooting this photo in the middle of the street, several Danish people were looking at me, smiling and saying something. My friend later told me that I should observe the crosswalk laws like all of the civilized Danes. 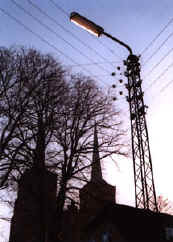 Even in Roskilde, utility and religious folks symbiotically determine the upward decorations of the landscape.